Spring Plungers - are used for locking and then locating of separate components and come in a variety of metric and standard sizes. These components use spring-force to apply pressure so that the ball or nose will remain positioned. These plungers have different installation methods including hex socket, slotted drive and top slot for blind-holes and have light, standard, or heavy end forces available to them. Spring plungers are typically made from stainless steel, steel, brass and nylon and are available in metric and inch with screw driver slots/hex drive sockets. Spring plungers are available in a variety of internal spring tensions and can have a locking mechanism to match your use. Ball Plungers - have no knob and a ball instead of a nose. The ball has little depth which allows for movement in and out of position. However, ball plungers do not perform well with heavy loads. Spring plungers are designed to have a nose that allows for movement when side-force is applied. Because of this, spring plungers are not suitable if a heavy side load is involved. Press Fit Ball Plungers - can be used when a threaded ball plunger is not ideal. Examples are installation in wood, plastic and other softer materials. Hand Retractable Plungers - are for positioning applications that requires simple and rapid locating. The nose of the plunger extends into the component holding it in place. When the handle is pulled back, it will disengage the plunger and will retract back into the body. These are also known as indexing plungers. Diameter - The diameter is the measurement side to side on the body of the spring plunger. Locking Element - Spring plungers commonly come with a chemical locking element. 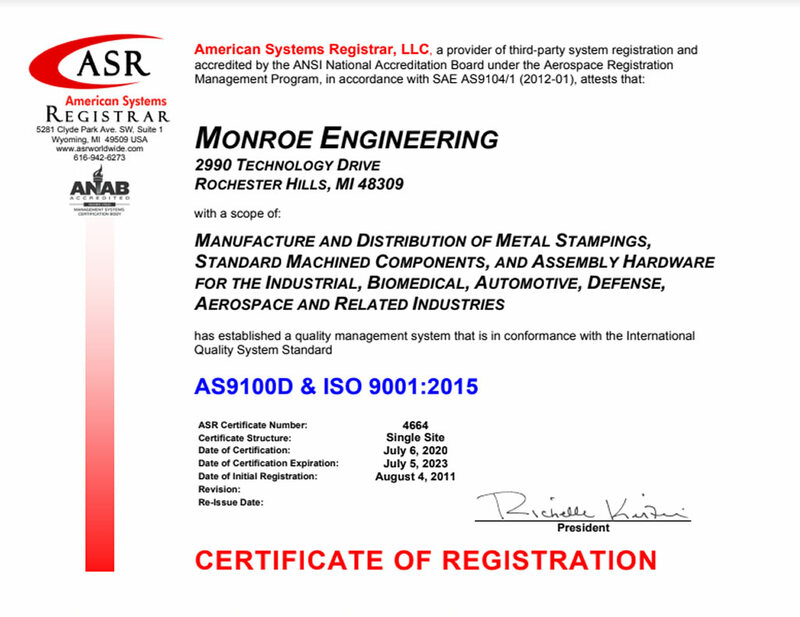 On Monroe websites, we include whether or not a plunger has a locking element in the title of the product. It is also included in the product's specifications. Plungers may be ordered without the locking element. Plungers without an element are the same price, but are considered "Special" and cannot be returned. Initial End Force - The Initial end force is the force required to begin compressing the ball down into the body of the spring plunger. Final End Force - The Final end force is the force exerted to compress the ball all the way down to the end of the body. The Final end force will be larger than the initial end force. 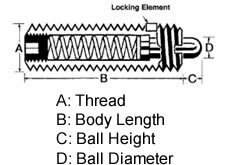 Thread Length - The thread length is the total length of the grooves (threads) on the rear portion of the body the of the spring plunger. The threaded portion of the plunger is the part that is installed into the device you're using. Body Length - The body length on a spring plunger is the length from the bottom of the plunger to the area where the ball protrudes from the body of the plunger. Material - The Material refers to the material used in making the body of the spring plunger. The nose material refers to the material used for the nose portion that protrudes from the body. The nose may be also referred to as the ball or the plunger. Stainless Steel, Steel and thermoplastic are common materials used for spring plungers. Plunger Diameter - The plunger diameter is the measurement of one side of the plunger to the other. The plunger is the part that protrudes from the body, it is also commonly called a nose or ball.